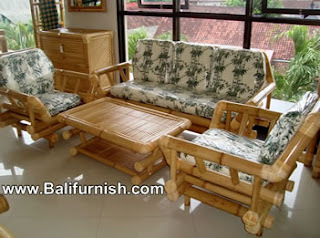 Bali Bamboo furniture. All kind of bamboo furniture such as bamboo table or bamboo chairs and bench. Handmade in Bali by bamboo craftsman and factory CV MAYA Bali. If you go to Bali Island, you will see bamboo everywhere. Balinese use all part of bamboo tree, from the root to the leaves. Here in Bali, there're many species of bamboo. We use different bamboo species for our bamboo furniture. We have complete bamboo collection, from living room bamboo furniture to bedroom furniture complete with bamboo home decors and ornaments. Bamboo Furniture from Bali Indonesia by CV MAYA BALI . Online catalog of Balinese bamboo furniture, various bamboo furniture from chairs and bench furniture set with cushion to bamboo bed and rack and shelves. Bamboo dining room furniture and lounge. Don't forget to view our catalog of bamboo gazebo and bamboo tropical huts or bamboo tiki bars. Since bamboo furniture is bulky in size, we only recommend this for a full container load order. The money you spend for one container of bamboo furniture is much less than hardwood furniture or bali handicrafts. If you interested in buying bamboo furniture from us. Please contact us, by phone, fax or better by email. Please remember to include your company details if possible with name of shipping port. We're bamboo factory and exporter company, we offer factory direct price. If you interested in visiting our bamboo factory in Bali, we'll be very happy. Contact us and we'll come to your hotel and take you for a tour to our bamboo furniture factory and manufacturer.